Story time comes to life with the Snufflehead finger puppet books! Bound into the back cover, a plush finger puppet peeks through the die-cut pages of the book, allowing children to follow the adventures of the animals as they journey through the stories. 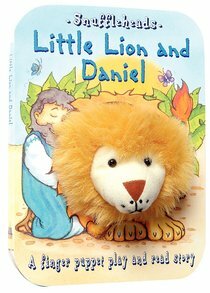 About "Little Lion and Daniel (Snuffleheads Series)"
Story time really comes to life with Snufflehead finger puppet books.hildren will love to help Little Lion learn about God's love from Daniel. Finger puppets--a favorite of kids', combined with adorable stories keep kids involved in this Bible-based storybook.